When the toilet is flushed, the user simply presses a button to stop the flush when the toilet bowl is cleared. 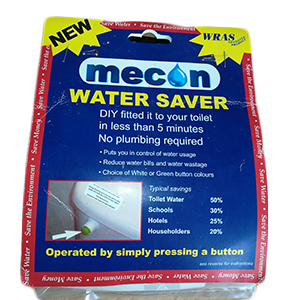 Mecon water saver button, locking nut, tube, tube connector, label, special mecon drill bit. Drill a hole in the siphon head with the special Mecon drill bit provided i nthe kit, (This special drill bit is placed in the tube connector for safety reasons). Use a high speed on your drill. Recommeneded drill seed in between 1000 and 3000 rpm. If installing more than one Mecon Water Saver, the same special Mecon drill bit can be used. Before drilling the second hole removee te piece of plastic from around drill needle. Push end of tube over the tube connector and press this firmly into button with rube facing siphon head. Insert the other end of the tube in the drilled hole. (Insertion depth about 8mm) Ensure the tube is not “kinked” at any point as this will restrict air flow. The tube can be cut with a scissors if too long.